The CNSP team has been working on research and development projects the past few months. One of our requirements with these projects is to accurately measure gas volume and gas molecules. The Alicat Scientific Mass Flow Meter with totalization allows the CNSP team to fill with a precise number of gas molecules on the ground, so the lift and volume of the gas at altitude is just right. The accuracy in measuring the lift gas is less than 1/3 of a gram. Because gaseous mass flow is standardized to a particular STP, this kind of measurement is fully independent of local surface weather conditions, temperature, and barometric pressure. By totalizing the mass of gas within each balloon, the CNSP team is able to generate repeatable data on our test flights. Indoor fills using our floating arm scale is no longer necessary. The Alicat Mass Flow Meter allows the CNSP team to fill outdoors with extreme accuracy. 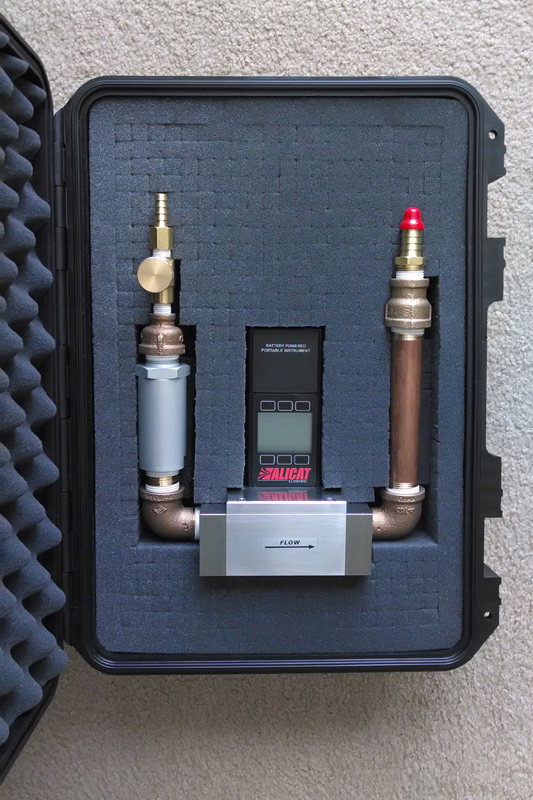 The Alicat Mass Flow Meters come pre-loaded with 30 gas and gas mix calibration curves. We can switch between helium and hydrogen gas properties with the press of a button. Working with Danielle Adams at Alicat Scientific was a pleasure as her customer service and attention to detail with our project requirements was outstanding! Below is a picture of the Alicat Mass Flow Meter. On the gas input line, we have a needle valve for flow control and a 40 micron filter.